24 postludes in all keys for violin and chamber orchestra. Norwegian author Jostein Gaarder (b. 1952) became an international celebrity through his Sophie’s World (1991), which in 1995 was the world bestseller, translated into 60 languages and in 1999 also filmed. The book Solitaire Mystery gave Henning Kraggerud the idea of a piece based on the number 24. The story of Equinox begins in London, where the narrator awaits a neurological diagnose. In the middle of the day he finds himself in Greenwich Park, and from there is catapulted on a kaleidoscopic journey to all 24 time-zones. The journey follows the circle of fifth from C Major through the flat keys, and when the journey crosses the date-line the music changes from 6 flats to 6 sharps. In four concertos, each encompassing six time zones, we travel from Greenwich to Greenwich, thus traversing all 24 keys. The music is expressive and accessible, often beautiful and quite often picturesque. The Afternoon-Concerto opens with highly romantic music, beautiful melodies and expressive string writing. It is followed by a fast waltz, depicting Prague, virtuoso and dramatic with a harsh dissonance before the short coda. The Alexandria movement has a mild opening, followed by a jaunty dance. Then we land in Baghdad, light and springy, but it grows darker and more intense, and then, almost attacca we arrive in The Aral Sea. The arid environment inspires Kraggerud to a fugato and some bittersweet musings – beautiful indeed. The afternoon ends in Jaipur in India with a sweet andante growing ever more intense but then relaxing step by step. The second concerto – Evening – starts in Dhaka, Bangladesh. It's jagged and dramatic relentlessly running through the hectic evening life. Bernard Herrmann’s string music - why not Psycho - comes to mind. We move to Lake Baikal in southern Siberia, the world’s deepest lake, and the hectic atmosphere is retained. From there to Hangzhou in China, beautifully situated on West Lake. We feel that we are deep in Asian culture, and Butterfly Lovers isn’t far away. Extremely beautiful. In B flat Minor we come to Kyoto in nocturnal mood, and so, over to Sydney and surely that's an inkling of the contours of the opera house? Riding on a whirlwind we then arrive in New Caledonia. The Night part of our journey begins in Taveuni, the third largest island in Fiji. There we dance a hesitant tango, before we travel on to Mary’s Igloo in Alaska: frosty and chilly surroundings but the warmth of the solo violin is redeeming. Slightly limping we arrive in Tahiti before continuing to Whitehorse in northern Canada. The horse is staggering and in the end indecisive. In Santa Barbara in southern California the fireflies surround us while the solo violin sings of comfort. We spend the night in Puerto Vallarta in Mexico - the town is in ¾ mood. Morning begins in New Orleans, the cradle of jazz, with intense rhythms and snapping fingers, while next stop, New York City, is highly cultivated – a string quartet in a Sky Bar. Via Manaus in northern Brasil we reach Hvalsey (Whale Island) in Greenland with the best preserved Norse ruins. The music is intensely romantic and Kraggerud’s solo playing is marvellous. We experience our first contact with the old world, the Portuguese Island of Flores in the Azores – the music is fast and joyous. Last stop – A Minor at its most melancholy – is Horn (wherever that is – West Africa?). The journey is over and we have visited all 24 time zones; not only that: we have also travelled in time back to the 1700s and 1800s. Each movement forms a postlude to Gaarder’s text. As a finale comes the Overture in C back in Greenwich, where we began. Then there's the question of the meaning of the keys. Is there some kind of consensus? Is B-flat Minor a dark key that lends itself to suicide attempts? Kraggerud asks that question and several others in his notes, fascinating reading no doubt, but those of us who don’t “suffer from perfect pitch”, as one of my music teachers expressed it, are surely unable to hear such nuances? Be that as it may, I have enjoyed this journey through the time zones. The music is varied, as my brief comments above may have shown, and I have not so far read Jostein Gaarder’s book. There are some short snippets from it quoted in the booklet. The playing of the Arctic Philharmonic Chamber Orchestra is excellent. The Arctic Philharmonic is the world’s youngest (founded 2009) and northernmost orchestra, based well north of the Arctic Circle. Henning Kraggerud’s capacity as a violinist is well-known by now – I first heard him almost twenty years ago – and it is nice to encounter him now as conductor and composer. 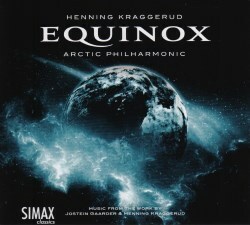 Equinox is a fascinating composition to return to over and over again.